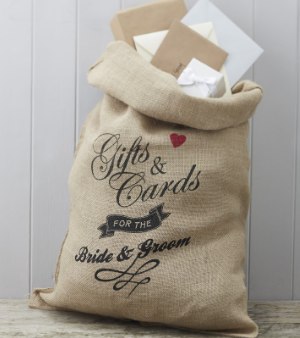 This great hessian cards sack is perfect for housing all your cards and gifts at your wedding. Guests can stuff sack with wedding gifts galore and being 80cm x 50cm it can even house some of the biggest gifts! The sack is printed with the words 'Cards and gifts for the bride and groom'. The sack also comes with brown string to tie after its filled up!